The transfer of chemical components that, when in solutions, have no effect on the physical properties of aquifer materials and groundwater, is inseparable from the groundwater flow. Their advective transport involves micro- and macrodispersion processes, which control the extent of solute dispersion in homogeneous and heterogeneous aquifers. In this chapter, we will consider the migration models that describe the motion of solutions miscible with groundwater in homogeneous aquifers. 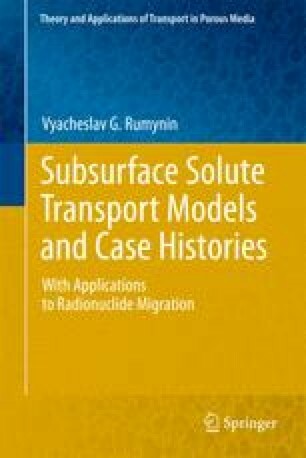 The solute migration processes in heterogeneous (stratified and fracturedporous) systems will be discussed in separate chapters.